In some cases, the RSFirewall! 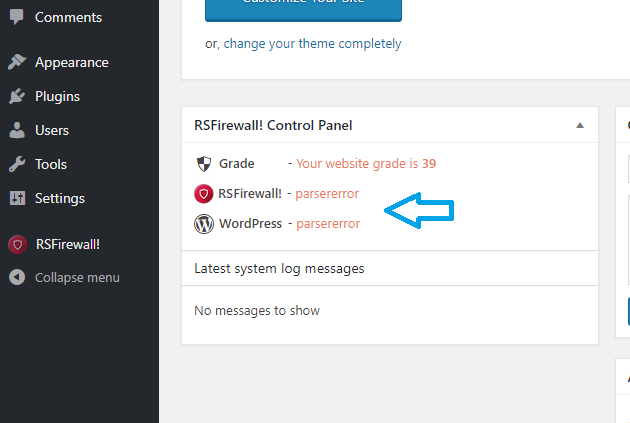 CPanel Module's RSFirewall! 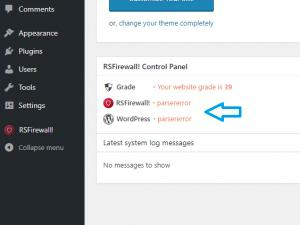 and WordPress areas return parsererror instead of information regarding RSFirewall! 's and WordPress's update status. This also applies for the System Check when performing the same verifications. The issue is usually generated by the fact that the fopen PHP resource and the cURL HTTP requests library are disabled. Edit your current template index.php file. Access your homepage and now PHP related information should be shown. Look for the curl section. If curl is switched off, its section should not be present. Scroll down to the Core section and verify if allow_url_fopen is set to Off. Remember to remove this line after you're done so that your homepage becomes normally accessible once more. If any of the cases presented above apply to you or you're not able to check this, please contact your hosting provider and ask them to verify, eventually have the curl and allow_url_fopen enabled for your website.